Firm connection between the screw and th magnetic holder. Screw fastening becomes highly efficient, as the screw is firmly held. Insert the bit, the bit is held on the magnet and is retained. Actuate the guide sleeve until the annular magnet is in contact with the screw head; almost any bit dimension can be used (Ph / Pz / Torx®). 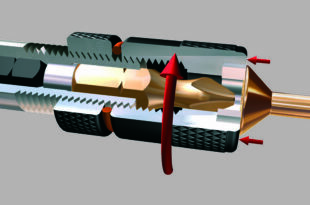 The surface of the screw head is held on the annular magnet incorporated in the sleeve. 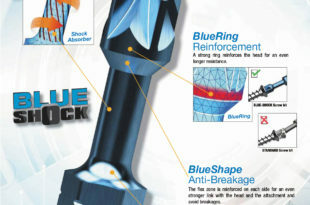 The screw is safely held and tilting or slipping is almost impossible. The screw has virtually become one with the magnetic holder. The screw is retained on the BiG magnetic holder with a force of more than 1kg. Quick change in one-hand operation. Fox II bitholder allows the insertion of the bit without retracting the sleeve. “jump” out of the holder and can be taken out without any effort. Thus, FoX II enables rapid bit change in one-hand operation. With the aid of the neodymium magnet and a retaining pin a safe clamping is achieved. As a result the bit is “locked” in the holder and unintentional slipping out or becoming jammed in the screw is prevented. Firm connection between the screw and the magnetic holder. material. Screw is perfecly in line with material which is not damaged for a perfect finish.